Isn’t it funny how the second Christmas is over, so is the holiday feeling? It’s hard to get inspired to buy even a random snowman at 75% off once the feeling is gone. That’s how I feel anyway. Then, all the sparkly lights that brought so much atmosphere into your house are suddenly gone and many of us are left with a living room that desperately needs an injection of happiness. I went shopping with a friend on the weekend and when I picked up a garland covered with leaves and lemons she said “Are you doing Spring in your house already?”. I took my faux garland home and piled it into a funky basket I found at a fund raiser last summer. Then to fill the basket, I added some faux granny smith apples. My faux Forsythia branches would probably look better in a vase where you can’t see the three lonely stems but I like that it’s a tall vase so it’s here for now. The orchid in my white pot has long ago died but the leaves look so green and fresh still that I kept it on the mantle as well. If I had a faux orchid in my house, I would have inserted it in the pot along with the leaves. I’ve done that many times. In this fabulous photo of orchids (above) they could all be fake and you’d have to be right up close to really notice. Faux flowers and greenery are an absolute necessity in the dead of winter. There is almost no where that I can buy fresh tulips where I live so I break out fake everything. Okay, you can find a kalanchoe in a pot in my dining room or kitchen but they can’t be on every surface! I like candleholders shaped like Aladdin is going to jump out at any moment. And buddha heads always seem to have beads nearby so I trooped over to my bedroom to locate a strand. See how these two coffee table books, one a little smaller on the top in the same colour scheme as the mantle provides a great pedestal for the smaller items? If you have a book that is not the right colour, try removing the jacket. There might be a better colour lurking underneath. Yes it’s true, I am known to be heavily swayed by a pretty book cover. If you don’t have books, a stack of magazines will work just as well. I have a room attached to my garage that is filled with rows of small shelves designed for storing canned goods. It’s filled with accessories that I rotate throughout my house. You’ll get bored staring at the same white porcelain penguins or owls all year long, and there are so many accessories that are just as seasonal as Christmas decor, there’s nothing wrong with tucking them away until you’re happy to see them again months later. For Christmas, Irene colour coordinated and organized our master closet and switched out all the hangers for white ones. 5. Give one room a fresh coat of paint. Anyone can paint just one small room, even if it’s just a bathroom. Here the pink beige and brown countertop doesn’t relate to the yellow beige floor but the brown is repeated in the cabinet, mirror and picture frames and the yellow beige is repeated in the stripes, pulling this bathroom together. 6. 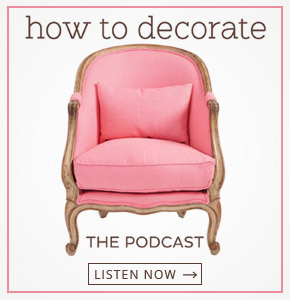 Create a starting point for your decorating by introducing two chairs with personality! You have to start somewhere when you’re looking for inspiration. Choose a chair that you like and then start building your room around the colour. I’m thinking next year, we should rent a house in Palm Springs for the month of January! Just work from there, what do you think? Is that a plan or what? Get away from the gray rain/sometimes snowy Northwest! I will be in Vegas in two weeks for the Las Vegas Market and the Withit Awards Dinner, then the following week in Los Angeles for another conference so I’ll see some warm weather then, hooray! What do you do to beat the January blues? Are Natural Fiber Rugs Neutral? 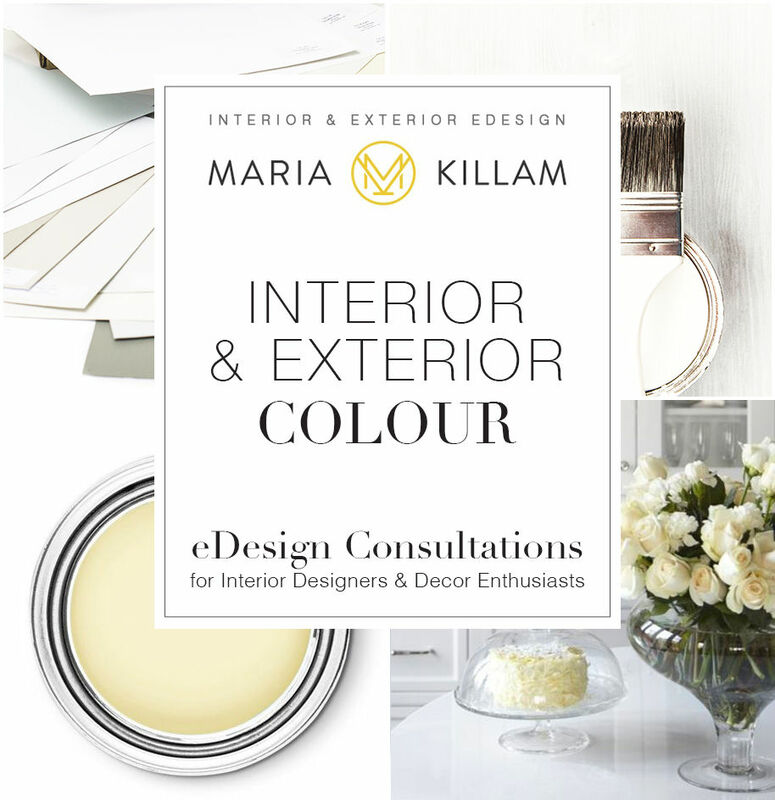 If you would like to learn how to choose the right white for trim, woodwork, cabinets and walls, get my brand new eBook, White is Complicated–A Decorators Guide to Choosing the Right White. If you would like to transform the way you see colour, become a True Colour Expert. Yay! We are about to do many of these things. I’ve killed enough low-light ferns in our no-light master bedroom that I finally decided to keep an eye out for a suitable fake plant at Home Goods. Also we are about to order a new sofa (finally!!) and before that comes I’ll be re-painting the living room. The paint is ready, I just have to do the work. When our Christmas tree goes out this weekend, I’m going to do SOME sort of non-Christmas winter decorating to make up for the loss of its color and cheer. I like the idea of rotating accessories! Hmm, maybe because I have never had enough space to do that before! I bought Ikea picture shelves so I can rotate artwork and have enjoyed mixing that up. Great ideas,Maria-I am always shocked how blah the house looks when all of the xmas decorations and lights are gone-funny, how we get used to it being bright and sparkly for a month and then wham,its over. You are making me see the benefit of fake flowers and plants,I have always shied away from them,but I am heading over to Home Goods today and see what I can buy to cheer my place up! Palm Beach next january is a splendid idea for you and your honey! We are in below zero temps around my house right now so Palm Springs sounds AWESOME! We’ve rented houses there before and have loved it. Do it!!! Thanks for this timely article Maria. I look forward to your blog posts! We’re moving into the dead of winter here, and the first signs of spring are months away. Even my decorator friend keeps the wintry look at least through February because spring looks so out of place. I keep pops of deep red in the living room as well as wintry accents here and there. Then, when we’re looking forward to the snowdrops and crocuses, I bring out my spring pillows and other accents. We do have a number of indoor plants, including a tree, that provide some freshness to our decor. Palm Springs is a great idea! We’re off to Hawaii in a few weeks. I was dreading taking down all the beautiful lights and color of the Christmas decorations, but then I picked up a bouquet of two blue Hydrendga cuttings for $5 at the grocery store and placed then cut short in a clear vase with some blue and white Chinoiserie and candles on my mantel. It looks amazing. Winter has hit us here in Montana, we have close to 20 inches of snow. I’m not a fan of the faux greenery. But I do love nature and branches. I will hike in the winter along the river and cut branches and bring home twigs and what ever else in color catches my eye. I have sprayed many branches , last year I sprayed some in metallic silver..
We have lots of red dog wood twigs and branches that look great too. Love to take the tops of the tall grasses and arrange them in vases also , they add a touch of wheat color and some Are silvery. .
Also love the branches with the dark red berries they look wintery yet add color. .
Any place with warmth and sunshine sounds wonderful!. Why fake and not real? One can get a nice orchid for under $20 and it will last several months. A bowl of lemons or oranges isn’t expensive. Try a dish of air plants. Real adds life to a room. I grew up in Hawaii, no seasons, no snow, always warm. (what a hardship!). So, now that I live in Virginia, I like winter, and after Christmas is over, out come my warm cozy animal prints…a leopard throw, dark pillowcovers, tortoise shell patterned candle cups, and a “can’t believe I scored this on eBay” needlepoint picture of a leopard lounging in a tree, which I prop on my mantel. Spring stuff comes out the end of February. BTW, Kay is my sister!! Saw her post after mine went up. Radically different styles, but we think alike!!! Living in Atlanta, I liked the romance of snow until last year. A January storm paralized the city for 2 days. Because I’m not much of a red & green X-mas person, my solution has been frosted pinecone decorations. Even Target had pincone wreaths this year. Come January, I just eliminate the Christmasy stuff and add more Winter Wonderland goodies, along with white & colbalt blue. LOVED that pintrest pix!! 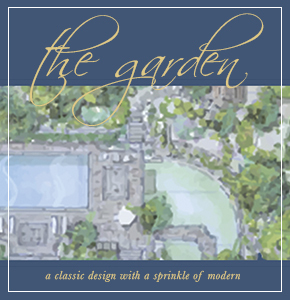 For more floral inspiration, check out Carolyne Roehm’s books. Excellent tips Maria! For Christmas I kept decorating to a minimum this year and didn’t regret it in the least as hubby came down with the flu on Christmas Eve and is now only feeling better. As am hoping to go on a holiday very shortly to Thailand for a four weeks stay, will not miss our cold climate in the least! Once back shall tackle my ongoing upgrades that will take me right into Spring. P.S: Love the striped chair and have filed it for inspiration. Maria, I hope our weather will stay nice for you. Today it is going up to 75 degrèes. It has been cold for us a few days ago! Where will you be in LA? What dates will you be here? I love your post today! It is depressing when all of the glitter of Christmas comes down. I like to use silk flowers because they look so real now! They have come a long way. The flower is only around for a few months but the plant tends to enter a resting stage, so if you’re leaves are happy and green, you may have another one grow in future! Happy New Year. I can’t say I have the January blues. I enjoy all of our seasons. I’m just glad I’m finally over the flu. I spent today cleaning & putting out my “everyday” stuff. To make it look new, I put things in new places. I’m not a fan of faux. Faux has to be dusted. Something real adds life to a space. If you don’t want to see the stems in your glass vase, wrap ribbon around the vase. Or wrap some big leaves around the inside of the vase. Ahhh, y’all are back 🙂 I’m so happy. I have been buying live orchids this week. I’m ready for Spring decorating this year. I think it’s because I’ll be selling my house in March and I’m ready to start staging! And I love your lemons they’re so fresh feeling. A tip for your vase: find some pretty paper and wrap around and secure with pretty twine or even just tape on the back. This also works to recover ugly hardback books. I did it on a bookcase and it was so pretty! Funny you should mention Palm Springs. We are there now figuring out how to renovate the kitchen in our vacation rental, and I’m using your book White is Complicated as a guide to try to figure out a white kitchen, when the floor will also be white (large white tile). Is it too much to have everything white? I agree that the house looks so dark and depressing now that the holiday stuff is gone. The only way I survive winter in the Midwest is lots of candles!!! I clip evergreens from my yard. I have Magnolia branches in tall clear vases on my mantle and Boxwood in my dining room. Also, I clipped some Rhododendron for 3 small red bud vases (used as a group) a month ago for the holidays and they still look great. All free and gorgeous! I have purposely planted things in my yard over the years to enjoy in my home. Good post. I’m glad you mentioned using faux greens – plants,fruit,& flowers. I don’t want to see faux greens everywhere in every room but I do think there is a place for them and they can work wonders in a room if done right. You really have to look hard to find good fakes though and sometimes it is just too expensive. I keep on the lookout all the time and have gotten some bargains. There is a kind of snobby – oh no..fakes! I think it can be done moderately and no one can tell the difference. I know two women who routinely have the florist do a couple of those giant-( rather old fashioned & dated to me )- faux floral arrangements for their dining tables, etc.. These women spend hundreds of dollars each season for these “arrangements”. To each their own but I don’t understand – they evidently could care less about the cost so why not just buy beautiful REAL flowers?! I this case I cannot understand going faux. But,their decorator is suggesting the big fake arrangements so – very dated I think.